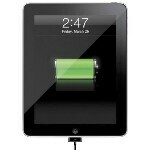 Criticisms revolving around the battery inside of the new iPad are not in short supply. According to one of them, the iPad battery meter does not give accurate readings. In particular, when the battery indicator shows that the battery has been 100% recharged, it reportedly takes about one more hour of further charging to reach its full capacity. Basically, when your iDevice is charging, the circuitry allows it to start discharging once the battery reaches its full capacity. Once the battery level reaches about 95% or so, the charging process continues. That is done because it is not a good thing having a battery charged to the maximum for prolonged periods of time as it may reduce its lifespan. In the meantime, however, a user will see a full battery meter, and that is because if it did run between 95% and 100% all the time, that would likely confuse the less tech savvy users. Batteries in most modern laptops, smartphones, and media players most likely follow a similar charging pattern. So there you have it, folks. There is nothing wrong with your iPad's battery, and if you really must have those extra few percent of juice, just get used to keeping your tablet plugged in after the meter has maxed out. Nope they're not wrong, and neither is android. Apples only wrong to the idiots who don't like the way they do things. Umm if you need someone to tell you, I was joking. I thought the "Puff the Magic Dragon" reference would have tipped you off! lol It's really not that big of an issue to get so bent out of shape! Remember the dark side is really NOT the good side. Come back to the side of the FORCE! You will be happier. If you go back and read the original article that brought up the issue, the writer said that it was a common issue found in android devices as well. I don't know if you guys are being purposely being stupid and ignoring information to be a better hater, or if you guys are legitimately confused. just about all devices stop charging once its full, let it drop down, and then recharge it. Some android phones go down to almost 90% before it starts juicing back up. It was a feature added in 2.2 or 2.3 to protect the battery. So thats not a big deal. But there is something wrong with the picture. Since when does it take an hour to charge 5%? or even 10%? consumer reports needs to do an accurate battery test to see how true Apple's statments may or may not be. yeah but if you read the article and 95% of the comments, the main issue isn't how long it takes it to charge 5%, it's simply the fact that it does it to begin with. As for the iPad taking an hour to go from 95% to 100%, I personally don't think it matters. If the goal was to reduce charging when full, wouldn't it be better to have it charge slowly form 95% to 100% than have it do so quickly? But regardless, consumer reports can look further into this, but as long as you get the promised 9-10 hrs of use at around 95%, its really inconsequential. In the off chance that there is any truth to it slowing down for the final 10%, there would have to be resistors of some type in the device. I dont really know of any "smart resistors" that only click on as needed. Its kind of a there or not situation. And if there were, they would cause some heat which would just exacerbate the already existing heat problem. But I agree, who cares what it says as long as your battery life is fine. Its not a bug, its a feature! No your charging it right. It is acctually a very smart feature. This way you can leave ur phone pluged in without worrying about killing your battery. No, it charges while in use no problem. In fact better than my Note. I doubt he even has a Note, he's just trolling. I love my note but it drains faster than charging during heavy usage. For example, when viewing movies via mhl hdmi adapter, it will continuously drain. Its easy to call one a troll without actual experience or technical knowledge. It's true. Samsung, HTC, LG, well let's just say almost all mobile devices have something similarly designed. Even batteries for your RC cars back in the day when those were cool. Watch out, we've got a badass over here! Yeah the only difference is my Nexus does exactly what's described in this article with the exception that I don't have to charge for an additional hour to reach 100%... How does this change anything? We get that it starts to discharge when it hits 100% but to take a whole extra hour sounds like something altogether different. But then again... there's a reason I don't get paid six figures to work at Apple. What do I know. That's exactly what the article is saying, you don't have to charge it a whole extra hour to be at 100%. I've read on the XDA forums about battery issues for Android phones that you have to leave the phone in another hour after it reaches 100% to be fully charged, because it trickle charges the rest of the way. Then you can unplug it so that the battery.stats can be properly generated. http://forum.xda-developers.com/showthread.php?t=937080 "1.2- Calibrating the battery Then, you should fully charge your battery. Not plug it off when the led turns green, but when Current Widget stops reporting a charge (it slowly decreases). You will see that it takes sometimes more than 1 hour after the green led, to fully charge your battery. If your phone is rooted, delete the file ‘data\system\batterystats.bin’ with a file explorer to reset your battery calibration, and reboot." Apple is not saying it's any one's fault. All their saying was that the battery charging wasn't accidental, but more for the people who always leave their devices charging and never take them out. It's the android fanboys that are putting a negative twist on this whole thing so don't be fooled. Also, Apple is not the only one that does this with their battery. http://www.phonearena.com/news/iPad-charges-fully-an-hour-after-the-battery-indicator-shows-100_id28373 Other smartphones and tablets also do this with their battery. But the problem is that everyone WANTS something to be wrong with the iPad and Apple products. If you read the comments in the link, you'll see that no one even wants to know or cares what those other smartphones and tablets are. Maybe it's me: “That circuitry is designed so you can keep your device plugged in as long as you would like,” Apple VP Michael Tchao told AllThingsD today. ".............it is not a good thing having a battery charged to the maximum for prolonged periods of time as it may reduce its lifespan". Do these sentences seem to be in conflict? All of you wiser people out there, do let me know! Its you. The thing is apple way of charging the device allows for you to keep your phone plugged in for long periods of time without affecting lifespan because it stops charging at 100 percent and continues at 95 percent . Yes it makes perfect sense. It's true, keeping your battery on a constant charge of 100% will shorten its lifespan. Basically, the phone stops charging once at full charge - 100%. If the phone is still plugged in, and the battery drops down to 95% it will start charging again till reaching 100%. Hence, giving you the ability to keep your phone plugged in as long as you would like. Thanks. That finally makes sense. Are peiple really trying to spin this to a negative its a reasonable explanation.